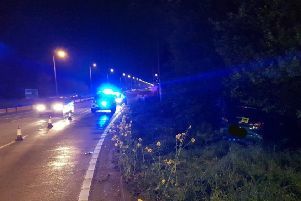 A driver has been taken to hospital following a collision with a central reservation. Following traffic reports this morning that said there was a two-vehicle collision on the A27 just outside Lewes. Sussex Police confirmed they had been called to a collision on the A27 westbound near the Kingston roundabout, Lewes, just after 6.10am today (Wednesday 21 November). According to police, a car crashed into the central reservation. The injuries of the driver are unknown at this stage and he has been taken to the Royal Sussex County Hospital.